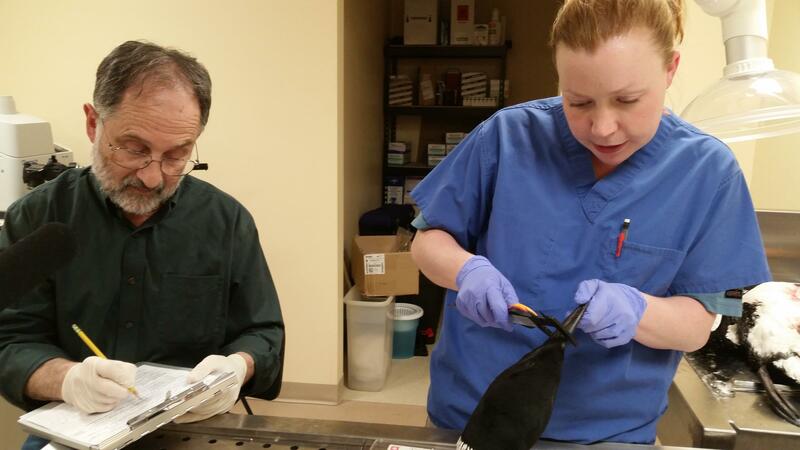 Veterinarians Michelle Kneeland and Mark Pokras perform a loon necropsy in a lab at the Biodiversity Research Institute in Portland. Susan Sharon reports on a possible new threat to Maine's loons. For years, researchers have been studying the pressures on one of Maine’s most-loved birds, the common loon. They’ve looked at shoreline development, mercury and fishing fear. And now a potential new threat has emerged: malaria. The tropical parasite started showing up in healthy loons about a decade ago. But it had never been known to kill a bird, until recently. In our latest installment of Beyond 350: Confronting Climate Change, why the presence of avian malaria is raising red flags for other bird and why it’s triggered a bigger investigation. Loons are loved for being mysterious, elegant and for their familiar haunting cry. But scientists say that cry could serve as a warning about the effects of climate change. They got their first big clue last summer with the discovery of a dead loon on the Maine-New Hampshire border. “There was a camper at Lake Umbagog who was also a Unity College student and went out and saw a loon that didn’t seem to be doing well and then later that day they found it floating and dead,” says Dr. Mark Pokras, a veterinarian who recently retired from Tufts Veterinary School and now works as a consultant at the Biodiversity Research Institute in Portland. He’s examined so many loons himself that he’s often referred to as “the dead loon” guy. “And he did what I think any camper should do and reported it to the rangers up there,” he says. It’s pretty unusual to discover a loon or any dead animal that isn’t rotten and decayed. But Pokras says scientists can learn more from cadavers that are fresh. That made this one a more precious specimen. So the rangers bagged it in plastic, put in a cooler and got it a ride to a lab at the University of New Hampshire. Then a pathologist examined its tissue under a microscope. “And found much to everybody’s surprise, not just the presence of this malarial parasite but the fact that there was a huge amount of damage, microscopically to the loon, to its brain, to its heart, to some other organs in the body,” he says. The findings were shared among several organizations that study loons. They were also sent to Dr. Ellen Martinsen of the Smithsonian who studies the genetics of malarial parasites. She says like people, birds are often exposed to malaria in other parts of the world. Michelle Kneeland performs a loon necropsy in a lab at the Biodiversity Research Institute in Portland. With climate change, tropical diseases like malaria have begun to show up in northern latitudes, transmitted by mosquitoes. What made this case unusual is that Martinson was able to determine that not one but two malarial parasites infected the loon and killed it pretty quickly. Every summer biologists at the Biodiversity Research Institute, or BRI, take blood and feather samples from the live birds, which are briefly captured and banded, to test for mercury and other toxins. “For us, for BRI, we use loons and other birds as bioindicators for health of the environment and we try to connect that health to our own health. They are connected. A lot of people forget that,” says Dave Evers of BRI. He says over the past two summers more than 200 live loon samples have been collected in this manner as part of a comprehensive health assessment of the population. Dr. Martinsen has also analyzed them to look for blood parasites to try to determine how prevalent they are and whether they’re increasing. What’s got scientists concerned is that avian malaria has been known to cause species endangerment in other parts of the world. The big question, says Pokras, is whether this was just one unlucky loon or whether it’s the tip of the iceberg. Dr. Mark Pokras (left) and Dr. Michelle Kneeland perform a necropsy on a dead loon. “And so I think one of the things everybody is gearing up to do now is focus alot more over the next three-to-five years to look for more loons, to get more blood samples, to try to get more freshly dead animals so that we can determine whether or not this is yet one more pressure on loon populations,” says Pokras. At BRI’s lab in Portland Dr. Pokras is performing a necropsy on a loon to determine its cause of death. Every year about 100 dead loons are recovered in New England. Most have been dead for awhile and are preserved on ice. But freezing them destroys their blood cells and makes it difficult to tell if they’ve been infected with parasites. So loon conservation groups are turning to hundreds of volunteers to help them find fresh cadavers. Susan Gallo is a wildife biologist with Maine Audubon. Dr. Martinsen says increased surveillance will be useful not only to try to figure out ways to control the spread of malaria parasites that affect loons and other birds but also those that affect people. 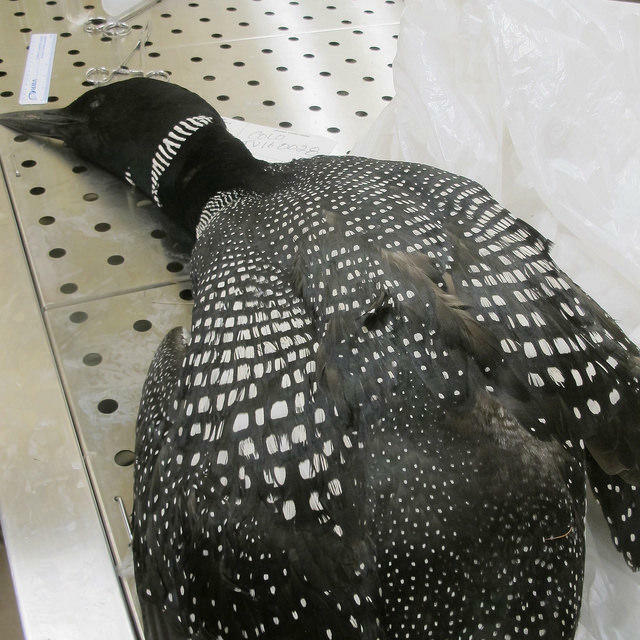 To report a recently dead loon, email deadloonmaine@maineaudubon.org or tweet using the hashtag #deadloonmaine. Beyond 350: Confronting Climate Change is made possible by a grant from the Doree Taylor Charitable Foundation. PORTLAND, Maine - The death of a loon from avian malaria on a lake straddling Oxford County, Maine, and New Hampshire is raising concerns about climate change and illnesses transmitted through insect bites.